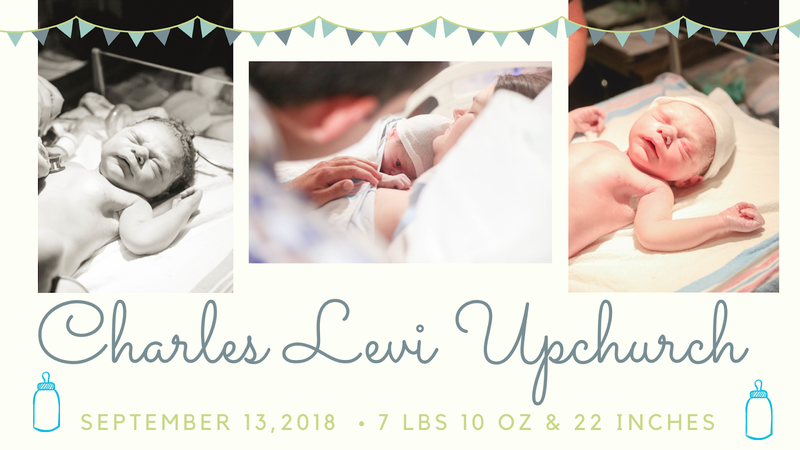 Christopher & I are thrilled to announce the birth of our sweet baby boy, Charles Levi Upchurch-aka, Charlie! He was born on September 13th, 2018 at 11:35 PM, weighing 7 pounds & 10 ounces and measuring 22 inches long & a head full of dark brown hair. 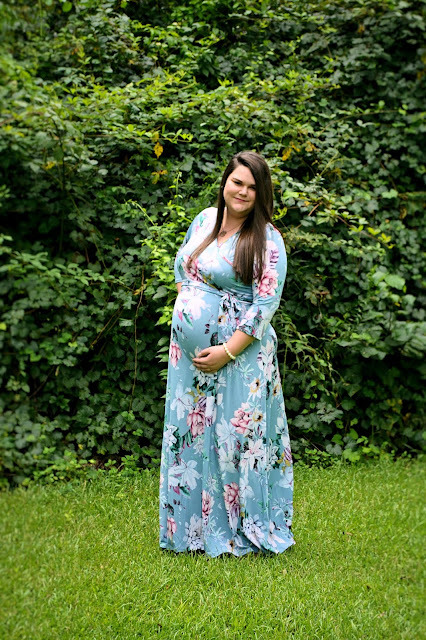 If you've been reading this blog or following me on social media for oh, I don't know...the last nine months?! then you would know that we're currently expecting our first baby-a little boy due this month! 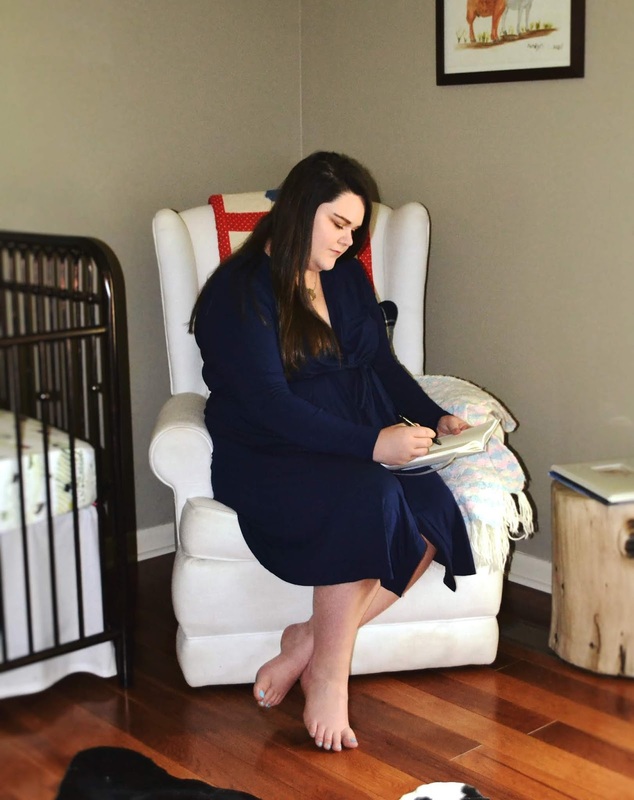 There are obviously a ton of things that need to be done to get ready for your baby's arrival from the nursery to installing the car seat, but what about when you've done all the basics and then you're just in limbo, waiting for your sweet angel to make their debut? 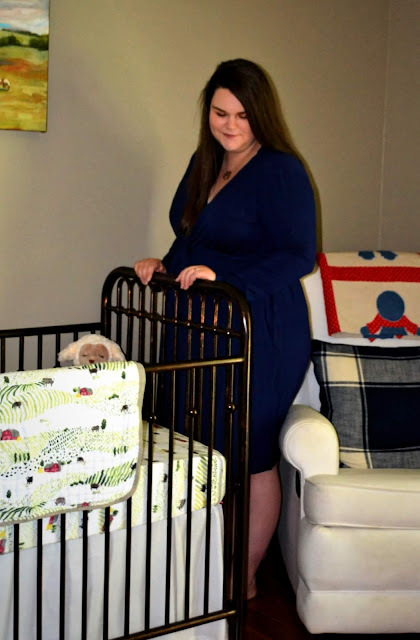 Since I'm currently in that phase, I wanted to share with y'all some sneak peeks of our nursery along with some tips of things you can do to pass the time until delivery day! 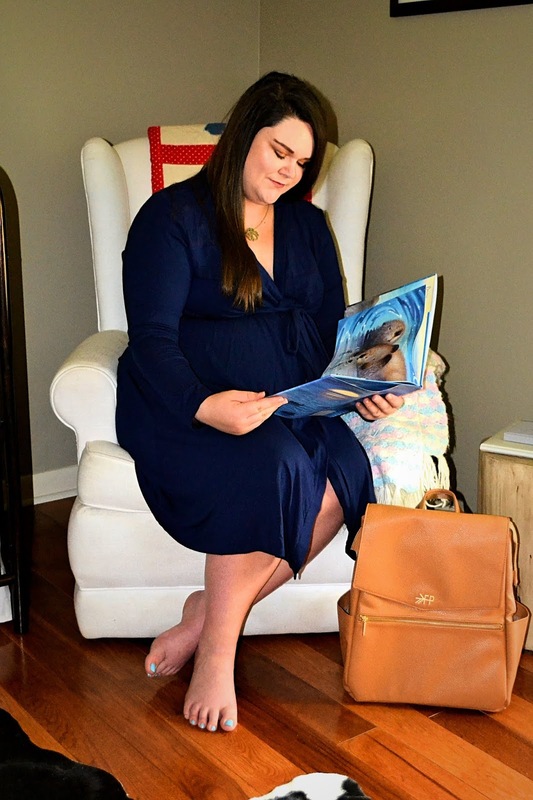 Packing my hospital bag was honestly something I waited until about 36-37 weeks pregnant to do because I wanted to make sure I had everything I wanted/needed, and guess what-honestly some of the packing you can't do until you're leaving for the hospital because you use those things every day. My favorite purchase for my hospital bag has been from my favorite retailer, Pink Blush. I wanted it to be blue and long enough to keep me covered when we had visitors, but it also needed to be light and comfortable so I could move around in it easily and not get too hot. 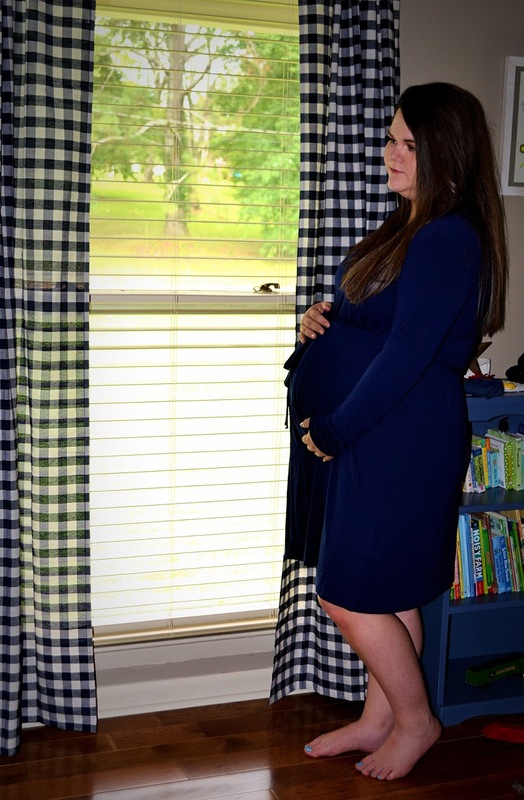 While they have tons of colors, this navy bamboo maternity robe was just what I wanted & honestly I think it will be great for our birth photos as well. Other essentials that I've heard from mama's that have done this before: Hard candy for when they won't let you have food anymore, your own pillow and throw blanket (in brighter colors/nothing that can be confused with the hospital's), and loose, flowy, comfortable clothing to wear home-nothing fancy or restricting! 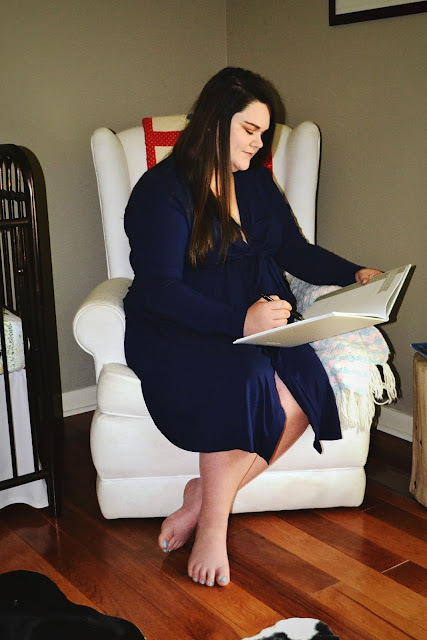 I know not all Mama-to-Be's are doing a baby book, but we were gifted one from our sweet friends & I'm so glad they thought of that because it had slipped my mind completely. There are pages for family history, baby showers, etc. and those can all be done before baby's arrival. 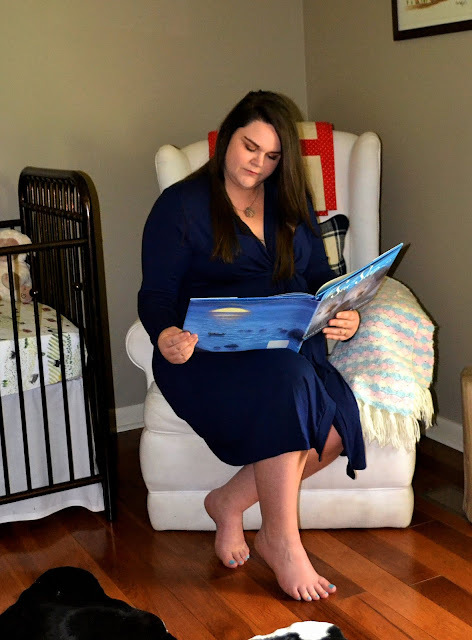 If you're planning on doing the baby book then try to get ahead before baby comes, that way you won't forget those pages! Another sweet gift we received for our little one was a journal to write letters to him or to note things he did or said as he got older. One of my September goals is to write my first letter to him before he arrives-so I'd better get on that! Journals can easily be found at the dollar store, Target, Hobby Lobby, etc. so just pick one up and give it a shot-it could be a fun memory for both you and your little one. Is there anything you just didn't get at your showers or as gifts that you realize you need now? After all was said & done and our gifts were put away in their spots in the nursery I realized that I desperately needed a few more crib sheets & several changing pad covers along with a few other things. It was great to go on and take stock so I could place one order for those (take advantage of your registry completion discounts!) at one time and have them ready for when our little one gets here and I'm not rushing to try to get them after he's already here. This can mean different things for each mom to be. Maybe you just want to sit in your nursery & contemplate what your little one is going to be like. Maybe you want to pray over your baby's future. Perhaps, you want to try to squeeze in as many date nights as you can before your two-some becomes three. Or, maybe you just want to head to Target and Starbucks by yourself before you're either rushing home to a newborn or trying to take one on your trips with you. No matter what soaking up the moment looks like to you, just do it. Try to get the best sleep you can, eat those meals that you love that maybe take a little extra effort that you might not have for a few weeks or months, enjoy a pedicure or reading your favorite book. Whatever it is that you enjoy that might get put on the back burner for a while, just do it! And a bonus sixth tip...get excited! 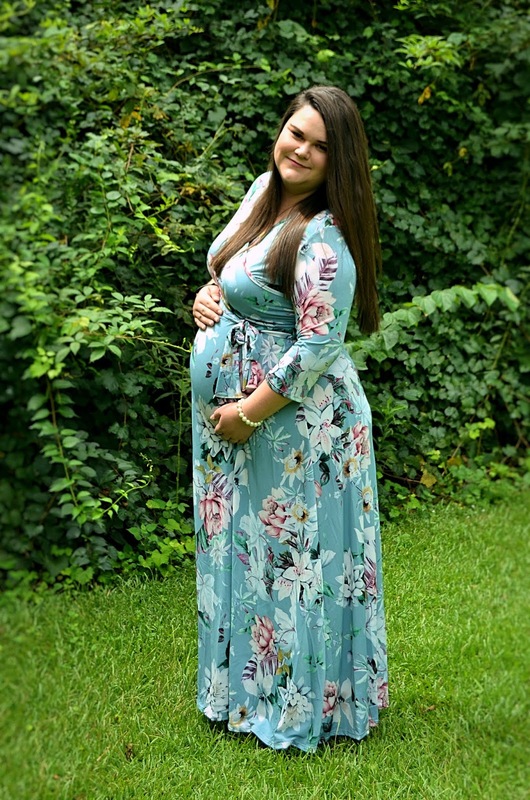 Your sweet baby (& mine!) will be here before we know it and while our lives will be totally different, they will be changed for the better. If you've had a baby or babies before, what did you do to pass the time while you waited on their arrival?! 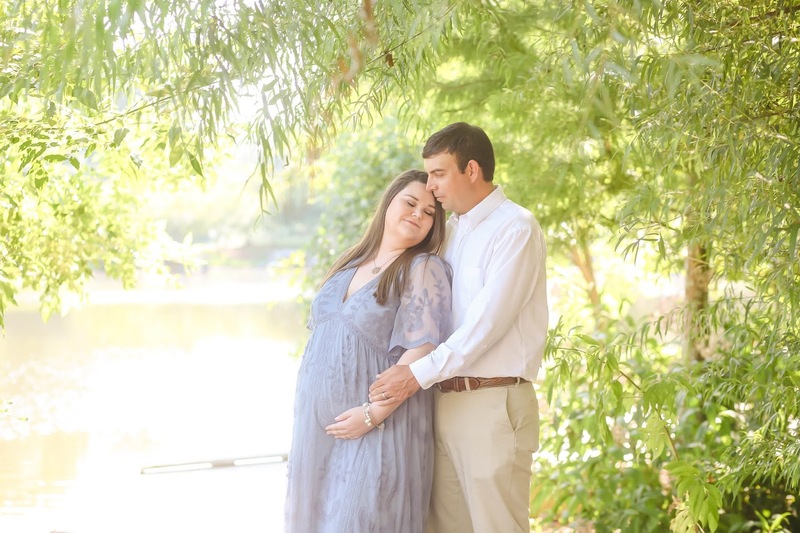 Hopefully our little guy will be here soon! I knew I wanted to get at least one last update post in before our little one arrives & if nothing else, I wanted to share this beautiful dress with y'all! Chris & I have been having several events to go to lately & I have worn out my favorite Lilly dress so I knew it was time for something fresh, but also something that could transition and be something to wear after baby is born. 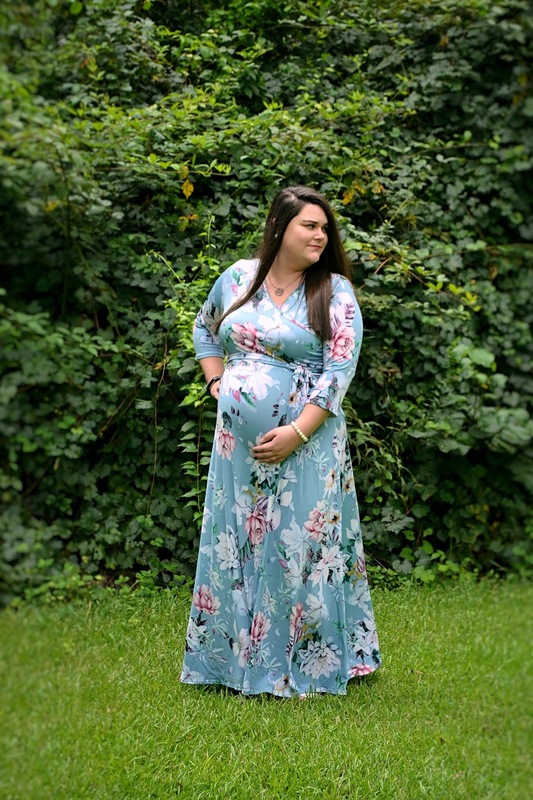 Pink Blush honestly has so many maternity dresses to choose from, there are five pages to shop through so if you're expecting they are definitely the place to visit! 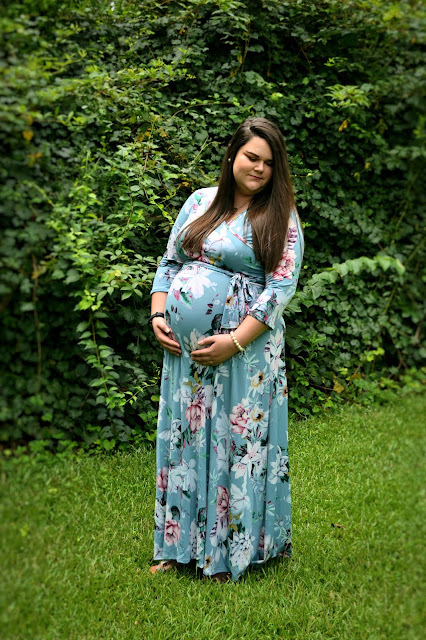 I love how I feel in this dress & am honestly looking for another reason to wear it before our boy makes his appearance...until I can think of one, I'll continue on to the update portion of this post! How far along? 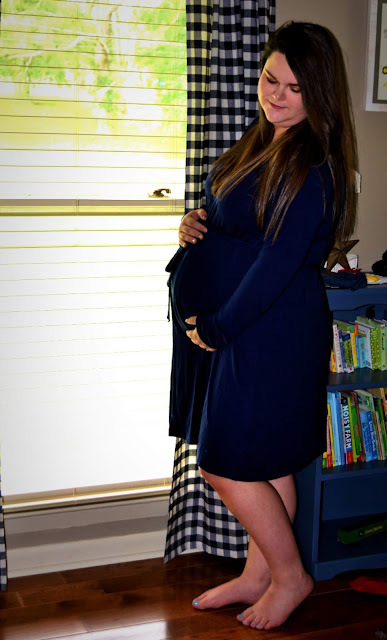 39 weeks now...technically 39+3 on the day this post goes live, but that's semantics. Days until due date? 5, counting today! Weight change? As of my last appointment, I had only gained 18 pounds total so that's exciting to me! Symptoms? Definitely just being very, very tired! It's hard to make it through the day without a nap now! And numbness in my hands-especially my right hand, it's so annoying. Did anyone else have that? Sleep? I would say that sleeping at night is really difficult at this point, which leads to a nap at some point doing the day. Movement? Although he's running out of room in there rapidly, he's still very consistent about moving and stretching himself out as best he can! Belly Button: In or Out? In! Wedding Rings: On or Off? The rings are totally off at this point, although my swelling isn't too-too bad. I just don't want them to go on comfortably and then start swelling while they're on. I have other things that I've been wearing in a larger size when we go out and about if I feel like I still want to wear something. Best Moment this week? Gosh, that's a hard one because things have been really great around here lately. I would have to say finally finishing up his nursery was a relief and it's really neat to see it 100% done & know that all we're doing now is waiting on him! Best style moment this week? Getting the opportunity to wear the gorgeous dress pictured in this post! 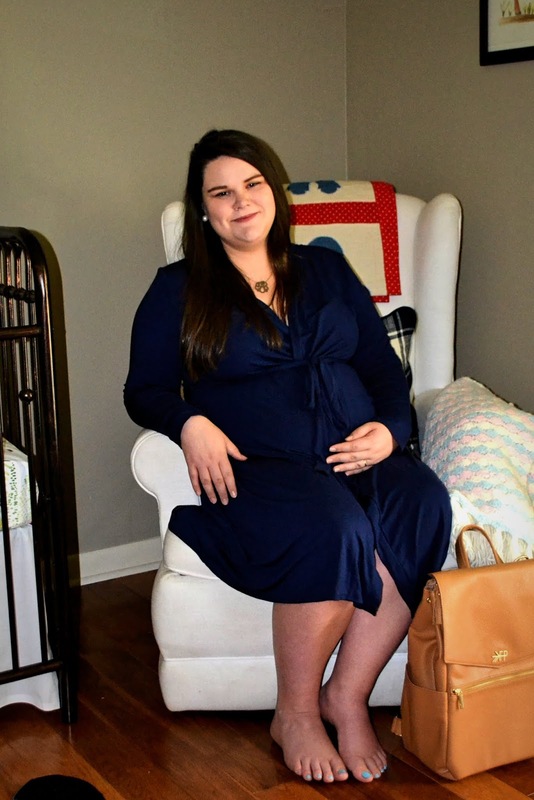 I wore it to a banquet last week and then got my mom to come over & shoot it as an actual outfit since I hadn't really done any outfit posts with maternity photos and I knew I wanted to have at least a few to look back on! Worst moment this week? There wasn't really a "worst" moment, but I think at times I am starting to get a little overwhelmed with the magnitude of bringing a baby into this world & then raising him-that's a huge deal! So just dealing with the anxiety of that has been the only "bad" thing about this week. What are you looking forward to? I'm just getting excited now for him to actually be here. I'm looking forward to seeing him with Chris after he arrives and sharing him with all of our friends and family...and it might seem funny, but I really look forward to him and Forrest bonding & hopefully becoming the best of friends in the future! Mood? Still nervous, yet excited-just like my last update. I really, really am thrilled that we're getting closer to him being here and finding our new routine and new normal but it's also really quite scary thinking about how our lives are going to be 100% different after he gets here. So there's some uncertainty, but nothing we can't get through! Can y'all see why I just adore this dress?! It's perfection, honestly. 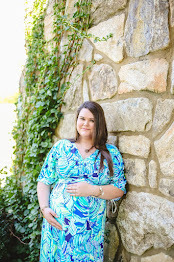 And anything that gives this 8+ month pregnant mama her confidence back is a winner in my book! It's so hard to believe that August has officially come to a close & that this is the month that we'll be welcoming our baby boy into the world! I keep going back and forth somewhere between panic and excitement, but I know that this is going to be the most thrilling journey of our lives, so I'm looking forward to a new normal. Let's see what I accomplished from last month. . . 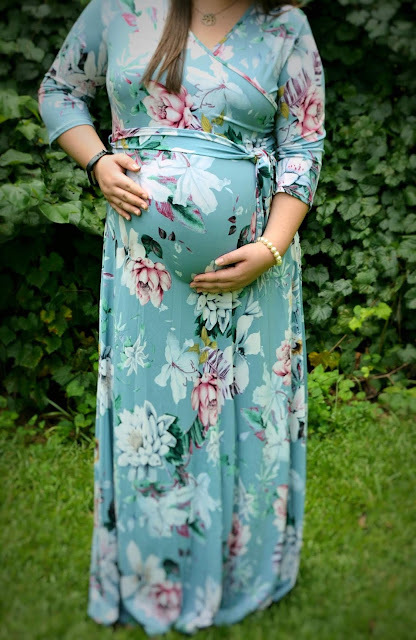 I really didn't feel inspired to "work" much on Instagram this month, this last trimester of pregnancy has really, really drained me & we've honestly just been so busy I haven't had time to make beautiful photos that I feel like are "worthy" of being shared there. I'm also focusing on real relationships on Instagram and not just gaining followers for the sake of numbers, so that's why I'm really into slow growth and having it being engaged growth-so I'm thrilled with this milestone! This is just a sneaky-peek of his nursery (& honestly there are a few surprise things I pulled out of this picture 🙈 because I want them to be revealed after our newborn lifestyle shoot!) but we are completely done with it! I do have to do some last minute tidying things up & there are a few things in there that after his arrival will be moved into our living room and into our bedroom, but for the most part-we're 100% ready for his arrival. Can I consider this "done"? I'll say half-done, because apparently technically this can't be done until he's born but I did check in on what needed to be done about it. I really procrastinated this, but it's finally done! There are a few things like toiletries and phone chargers/camera that will need to be added as we head out the door or brought by family members, but anything that can be packed ahead of time is done. I even have some snacks packed up! We had a lot of fun together at the Alabama Farmer's Federation Commodity Conference, which included some riverfront walks and dining at delicious restaurants together, we went out with some friends, we took a Sunday afternoon date-day to get Chris' hair cut and to do some shopping, and of course we had our town's first Cattlemen's Rodeo last weekend which was a blast! This is done, done, and done! I've done really well getting all thank-you's out for gifts that are mailed directly to us as they come in (and keeping up with them on a spreadsheet, just in case!) but the shower gift thank-you's have been daunting just because of the long list. As of Thursday, I crossed this off of my to-do list and it felt SO good! I'm so incredibly blessed to have a sister & mom who live close by and have time to come help me clean my house and get things done around here because if not...let's just say, my husband wouldn't be happy! My middle sis came over & helped me do a lot of cleaning and we spent a few minutes breaking out the paint brushes & touching up our front door hangers. We still need to add some ribbon, so I've got to get to the store ASAP to pick some up, but other than that they look great and are ready for visitors! I'm trying to keep in a good cleaning routine & not let things pile up since we could have this little guy any day now. I want to be able to enjoy my time with him next month and not be worried about our house being a wreck! One of our friend's gifted me a journal to share letters to our sweet boy & I've yet to sit down and write anything. I think I need to write at least once before his arrival so I need to sit down and do that! I just don't want him to feel sad or left out and resent his little brother, so we're going to shower him with as much affection as possible! It doesn't matter if it's just eating breakfast together in the morning or heading to our favorite dive in town for a milkshake at the end of the day, I just want to soak up as much time with my number one guy before there are three of us! I'm guilty of trying to pack in too many things right now & so this should've been number one-I need to try to rest up before the big day! I think that about covers what our September is going to look like-basically a lot of cuddling & surviving, but we're looking forward to it. If you have any tips/tricks/advice for me in the upcoming days, I would love for you to leave me a comment below!